« Sacred Skin Besteller in Bangkok Airport! For many years, I have been reporting on the plight of Thailand’s minorities – the so-called ‘hill tribes’ in the north of the country, and the sea nomads, also known as sea gypsies in the south. Unfortunately, much of what I have written about the problems these stateless people are facing, has been published in German. 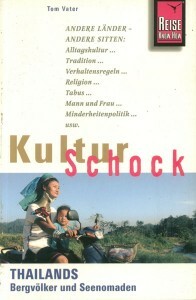 My book Kulturschock Thailands Bergvölker und Seenomaden, published in 2006, remains in print and I have recently written about the continuing threat from missionaries who coerce hill tribe villagers to become Christians in Spiegel online and MERIAN. While I was researching my book on Thailand´s minorities, I did publish a brief summary of the country’s main ethnic communities in English and I am reposting this short English-language introduction from Lifestyle + Travel here. Readers interested in Cambodia’s ethnic minorities should take a look at this report about the country’s Bunong community, I produced for FFI (Fauna & Flora International).